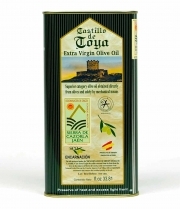 The olive oil protected by the El Empordá Designation of Origin is developed by olives of the argudell, corivell, verdial (Ley de Cadaqués) and arbequina varieties, separated or together, with a maximum of 20% of other varieties from the area. The olive oils are clean, transparent, very nice on the palate, very tasty and scented; they are sharply-flavoured olive oils with a balanced hint of bitter and spicy with an intense fruitiness and a noticeable flavour complexity. The municipalities that make up this area of production, development and bottling for the Designation of Origin of El Empordá include Alt Empordà, el Baix Empordà, el Pla de l'Estany and Gironès.